While a blower door test is the best way to locate duct leaks, you can often locate supply duct leaks with your hand because supply leaks blow air out. However, return leaks draw air in, so you won't be able to feel them easily. Duct repair professionals use a smoke pencil to detect return leaks. A leaky return duct draws in a puff of smoke. You may be able to detect return leaks using a smoke canister, incense, or by moving a lightweight piece of tissue over the ducts. It is easiest to detect leaks in un-insulated ductwork. However, insulated ducts can also have significant duct leakage. 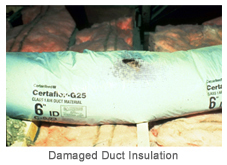 The fiberglass insulation covering the ducts is not an effective air seal. The inside surface of this insulation can offer clues to whether the ducts leak. Look for streaks in the insulation, which appear as dirt is filtered from air passing through duct leaks. As a general rule, it is most important to fix large holes first, such as a disconnected duct or gaps between pieces of ductwork and the holes closest to the air handler because the pressure is greatest there.